I love making homemade granola! It can be a delicious, yet healthy treat or addition to your breakfast. You can have it with almond milk, as a topping to Greek yogurt, or just have on hand while traveling. It makes a great snack food. I always find that it is better to make your own granola, as most store-bought versions are generally high in sugar. Not to mention unhealthy fats/oils. I know you can buy healthier, lower-sugar granola, but I find that it is much cheaper to make my own! 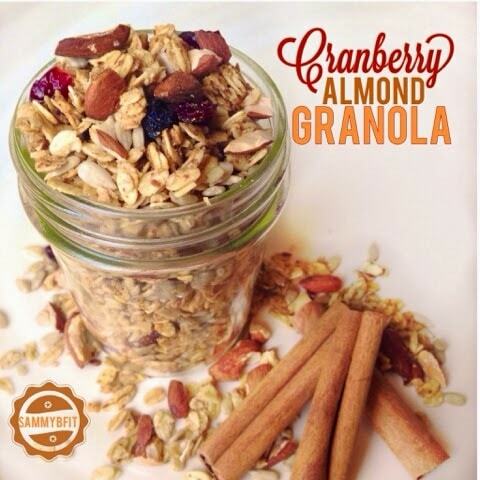 You can add just about anything you want to granola. Don’t like honey? Swap it out for maple syrup! Not a fan of craisins? Try any dried fruit! Did I mention how yummy the house smells while it is in the oven? The smell of cinnamon fills your kitchen. Preheat oven to 325 degrees F. In a large mixing bowl combine oats, nuts, seeds, and seasonings. In a separate bowl combine the coconut oil, extract, and honey and stir very well. Slowly combine the oil mixture into the oats bowl. If necessary, use your hands to thoroughly mix the ingredients. Make sure that the oats are coated with the oil mixture. Place the oats onto a cookie sheet, lined with parchment paper, into a very thin layer and bake anywhere between 25-35 minutes. Check the granola every 15 minutes to see if its done and to stir it. The granola should be lightly toasted. Baking time will vary depending on climate and oven used. Enjoy! Excelent recipe. I’ve been making this granola for years. Thank you!!! (Instead of using cranberries I use raisins and add them after I bake the granola because if I bake the raisins they get hard).